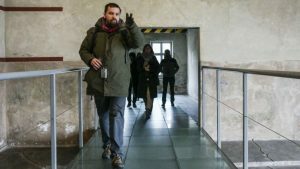 VIENNA, Austria – Austrian MPs voted late Wednesday to expropriate the home where Adolf Hitler was born, ending years of bitter legal wrangling with the current owner over the infamous building’s future. Local resident Gerlinde Pommer — who has been renting the premises to the Austrian state since 1972 — will receive compensation under the legislation. It is not yet clear what will happen with the yellow corner house at Number 15 Salzburger Vorstadt Street, located right in Braunau’s historic center. In October, Interior Minister Wolfgang Sobotka announced it would be “torn down” to make place for a new building to be used by a charity. But several of the 13-member panel were quick to deny that the commission had backed Sobotka’s push to bulldoze the place where Hitler was born on April 20, 1889. “A demolition would amount to negating Austria’s Nazi past,” the experts said in a joint statement in October. Although Hitler only spent the first few weeks of his life there, the address has been a thorn in Austria’s side for decades, drawing Nazi sympathizers from around the world. Her family has owned the 800-square-meter (8,600-feet) building for nearly a century. Since the early 1970s, the government had been renting the premises for around 4,800 euros ($5,000) a month and used it as a center for people with disabilities. 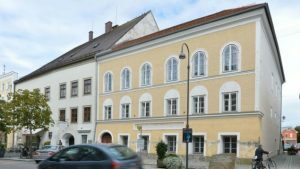 The issue has also sparked debate among Braunau’s 17,000 residents. 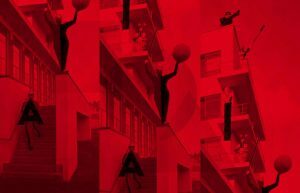 Some want the building to become a refugee center, others a museum dedicated to Austria’s liberation from Nazi rule. At first glance, the wide-wale corduroy jacket in the box atop the tissue paper might be a gift for Dad or Grandpa — an L.L. Bean special he can wear as fall turns to winter. The cut, the color, the buttons, the pockets — they all look entirely familiar, like the brown corduroy jackets found in countless catalogues and department stores. Without context, this jacket is a study in banality, as prosaic as they come. But appearances can be deceiving, especially when it comes to material culture. This particular jacket is, in fact, suffused with meaning, history and a life experience that diverged dramatically from the norm. If it represented banality at all, it was the banality of evil. Last week, Michael and Peter Feuer, whose late father Otto was one of a small number of Jews to spend 12 years under Nazi rule and survive, presented their father’s brown corduroy jacket at the 2016 Philadelphia “What You Do Matters” Dinner of the United States Holocaust Memorial Museum. The jacket, along with a gray-and-blue striped concentration camp uniform, were worn by Otto at Buchenwald, the last of three concentration camps in which he was imprisoned. The Feuer family has now donated his clothing (along with other items) to the Holocaust Memorial Museum, whose collection of artifacts is expected to double in size in the next 10 years. Peter Feuer, who lives in Rydal, also donated $1 million to the in-progress David and Fela Shapell Family Collections, Conservation and Research Center, which will have climate-controlled environments, preservation equipment and highly specialized laboratories to house and conserve the collection. Thirty-three Greater Philadelphia residents have helped that collection grow by donating personal items, and the “What You Do Matters” Dinner was held, in part, to thank them. About 15 donor-survivors were able to attend, including Eve Przemyski, 93, who seemed a little chagrined about being honored in the evening’s affair. Przemyski gave the museum the diary she kept as a teenager, which she titled Behind the Barbed Wire: A Diary of a Year in a German POW Camp 1944-1945. Though she wrote it in her native Polish, she had it translated in the 1990s. “It’s a very moving story about a teenage girl who lost it all,” her son-in-law, Jack McFadden, said proudly. When Przemyski gave her diary to the museum in 2011, she also donated family photographs, identity cards, immigration documents and other ephemera that may be of use to families and researchers, especially given that Przemyski’s mother sheltered two Jewish women during the occupation. “They both survived,” Przemyski said. Boris Altshtater, 78, who was born in the former Yugoslavia, also gave the museum many documents. Alshtater said his father was allowed to write 20 words in each letter. As a toddler, Altshtater was in two concentration camps himself — as well on the run with his family in the forest — but there’s much he doesn’t know about his own history. “My mother didn’t want to tell me anything,” he said, but the family did save photographs of the young Altshtater taken in the camps. Those are now in the museum’s collection. Przemyski, Altshtater and the other survivor-donors were all praised effusively by the evening’s speakers, including Andres Abril, director of the museum’s Mid-Atlantic Regional Office. As a slideshow of artifacts was displayed on video screens behind him, Abril said the museum’s success depended upon the power of these objects to illuminate personal histories. The evening’s next speaker, Elaine Culbertson, has been using the museum’s treasures for many years as an educator. The program director of the Holocaust and Jewish Resistance Teachers’ Program, Culbertson is the daughter of two survivors who heard many stories of tragedy and triumph from her parents and their survivor friends growing up. She became a teacher in the Philadelphia school system, but at the time she didn’t teach the Holocaust because it wasn’t part of the curriculum. Then one day something happened to change her mind. When she became a teacher of other teachers, Culbertson took them to the museum and had them choose an object that would illuminate history for their students. 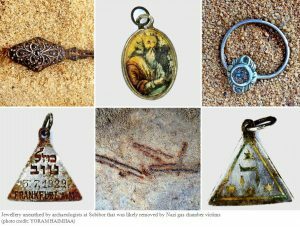 Last summer Dupas worked with nine students who also found artifacts that resonated for them. The night’s final speaker was Eli Rosenbaum, director of the Justice Department’s Office of Special Investigations. Rosenbaum, a Penn alum, has spent his career pursuing and prosecuting Nazi war criminals, including several who made their lives in Philadelphia. He spoke of the role artifacts play as forensic evidence, without which he could not do his job. Though the evening was replete with video testimonies and fascinating speakers, there was a sort of reverential awe that was reserved for Otto Feuer’s garments — including that regular, old corduroy jacket. At the end of the night, attendees were welcomed to the front of the room to see the both the jacket and uniform up close. 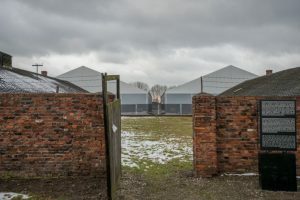 As they crowded around and peered into the boxes, it was clear: Words and pictures tell us a great deal, but there is nothing that compares with survivor artifacts to convey the experience real people had during the Holocaust — a world event that, without this material testimony, would be too horrific to believe.